Bindings can be used to perform calculations on your form such as calculating the total cost of a selected product and multiplying by the selected quantity, or to increase a total cost value/field based on selected options. In the above example, we're checking which product was selected and executing a calculation based on the selected product. This works when you have only a few products, but gets difficult when you have many products with different prices. Bind Values are values assigned to each option of a Multi Choice Field (CheckBox, Radio or Drop Down) that can be used in a calculation. The Bind Value field is only used when writing calculations. It is not used when you write the conditions of an IF/THEN/ELSE statement. When writing an IF statement the "Data Value" is used in the comparison. This would use the bind value from the selected option in the product field and multiple it by the quantity. Currency formatting can be applied to the result of a bind statement by settings the fields mask property to one of the available currency formatting options or using the currencyFormat wildcard Function. In the Field Properties > Field General Settings panel, find and click the Mask property. Select the type of currency formatting to apply from the list of available options. If the bind statement is on a Basic Header or Label element, the mask property will not be available. The alternative is to use the currencyFormat() wildcard function. In the Binding Editor window, highlight the value that you want to format with a currency. Click the Functions button in the toolbar. In the window that appears, select the type of currency, and then click Save. This will format the results of the [product]*[quantity] calculation with currency formatting. Often, you'll want to make the field that has a binding on it read only. This can be done by changing the fields read-only property to true in the Element Properties Panel. Ensure each option has a bind value present in the bind column in the Field Values window. 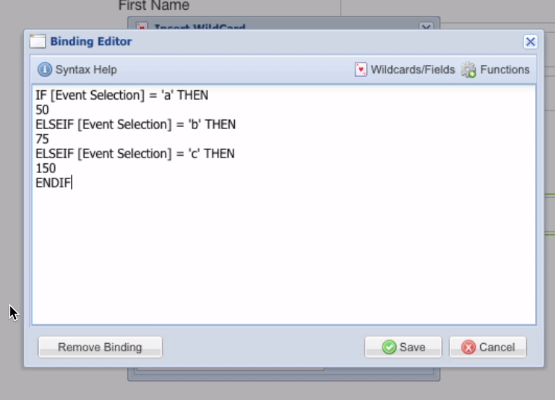 In your binding, insert the wildcard of the field you want to use in the calculation. Highlight the wildcard and click the Functions button in the toolbar. Scroll down to the very bottom and select the addSelected() function, and then click OK. This will evaluate to the sum of all of the bind values for the selected options. You can use this anywhere within your calculation. This video showcases an example of how to use the addSelected() function.